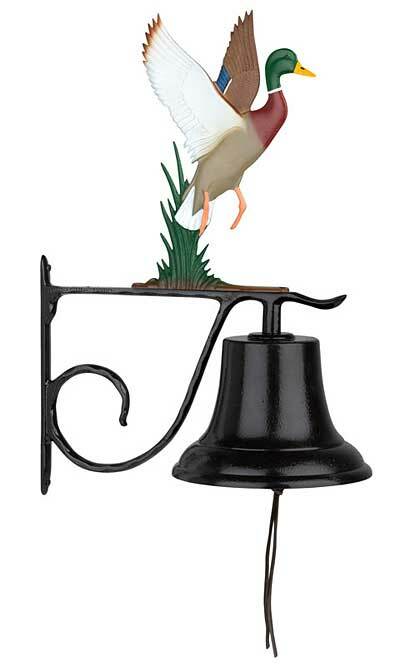 Add country charm to your home with the Whitehall Large Country Bell with Duck. A large mallard, complete with his orange feet still in the reeds, is immortalized in mid-takeoff and placed atop the bell. The exquisite detail on the hand-painted ornament showcases the craftsmanship of the individual artist, while the accent lends depth and character to the fully functional bell. Sound the bell in celebration or to summon people at mealtime with the metal clapper attached to the leather cord. The included 9.5" mounting bracket easily screws into walls, posts, or trees. Attach the mallard to the 13" bell arm with two included screws. The heavy duty aluminum construction will keep the Whitehall Large Country Bell with Duck looking and sounding great, year after year. Made in the USA. Achla Wrought Iron Bell, 4" dia.